Join the discussion on our forums! Come discuss Hired Gun over in our dedicated Hired Gun discussion topic. why would hired gun never be able to be a good CEO for a company? I'm so glad somebody else noticed. Talk about a nice pack! Perhaps he's wondering why someone would shoot a man, before throwing him out of a goblin airship. they printed Evil Heckler because they found or thought that Booty Bay Bodyguard was too weak. Nope, Ironfur is a beast so no power creep. Except no one plays the grizzly for its beast synergy, making HG an effective powercreep. Grizzly is an arena 3-3 taunt. That's it. Except no one plays Hired Gun either so it isn't powercreep because of that as well. Stop calling every new card that is slightly better than an unplayed card yet still unplayable "powercreep"... Powercreep implies a loss in the balance of the game, and this won't even be played. [Power creep is] The gradual unbalancing of a game due to successive releases of new content. 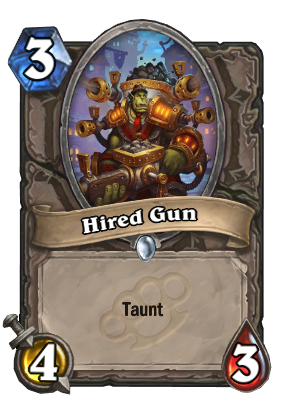 As you said, Ironfur Grizzly is a beast so we can't even say Hired Gun is strictly better. But even if we could, that would be all. Strictly better yes, but not power creep, because being strictly better yet still too weak to affect the meta isn't power creep. Something that has absolutely no consequences on the meta can't be considered to affect the balance of the game. This little difference between "Strictly Better" and "Power Creep" is the important part. Now, I'm not saying there's no power creep in Hearthstone, but if you want to find it, stop looking at mediocre cards. For example, 4 mana 7/7s and 0 mana 5/5 taunts, while not being usually compared to older cards, and avoiding being called "strictly better" as a result, do constitue a power creep, since nothing in the game before had such a power level. Again, if it's not playable, it's not power creep. What you mean is "Strictly better". Pompous Thespian is strictly better than Frostwolf Grunt, but is not good enough to imbalance the game. Something can be strictly better than an other card without breaking the game. It takes a lot of cards being strictly better than older cards to make little stats adjustments on textless cards like that power creep. As for the "gradual" part. It's here for games that don't rotate sets. In those games, the old sets become unplayable not because the rules say so, but because the newer sets are just better. As a whole. Not just because one taunt as +1 atk, but because the whole new set is on another power level. It's gradual because each new sets makes the older sets a little worse, making the whole collection more and more imbalanced. Hearthstone isn't concerned by this because older cards gets rotated out, as in Magic. Team5 tries to keep the power level around the evergreen basic classic sets. Sure, they make cards slightly better than vanilla cards from time to time, but it's never strong enough so that you think "man, those cards are so strong that even in Wild, an old set like GvG won't be playable anymore". If you want to see true power creep, check "Yu-Gi-Oh! ", the game is famous for it. Tottaly agree with you this one instance can not be considered power creep...BUT It's just for punctuality's sake that what you said can be misinterpreted. The thing is that yugioh power creeps for sales (and it's doing a preety good job sometimes imo), while magic does the exact opposite of that making cards GRADUALLY less and less powerfull, if hearthstone does things the magic way we might be seeing what i described above because magic has always kept a linear progresion in power levels (go see if any extended deck uses more than 10 cards used in standard and u'd b surprised by how weak the game proggreses to be). So no I don't think that if blizz wants to gradually make cards better I'd be one to stop them, because magic gets worse every year because of having a negative linear progression.